Only in the age of Trump would this piece of stupidity be proposed. FiveThirtyEight’s Significant Digits email has a summary. Coal being replaced by other energy sources. Why should Homeland Security foot the bill? Why should any government agency be stuck with paying for this backward thinking subsidy for a dying industry. 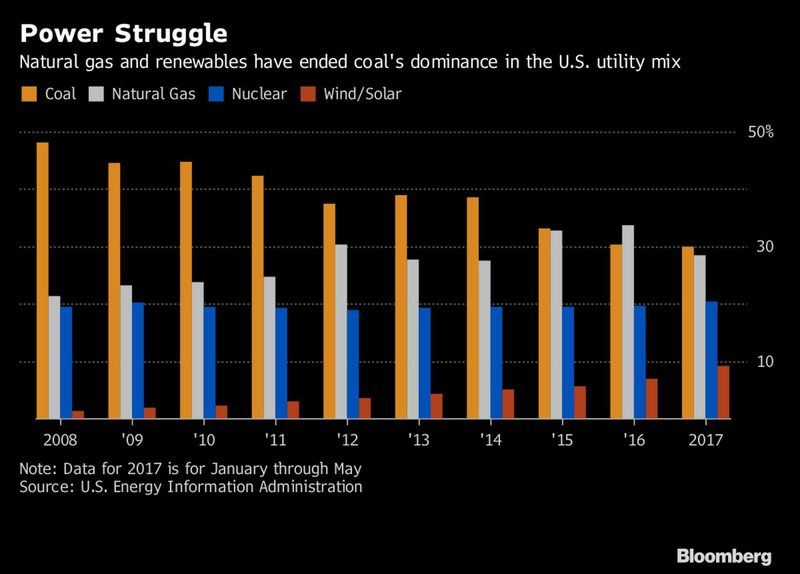 The evidence on the demise of coal is in this graph from Bloomberg. Nevertheless, Justice is touting his idea to Trump. Here is more from Bloomberg’s report, Governor Says Trump Interested in His Plan to Prop Up Coal Mining. In Justice’s eyes, the coal payments will be necessary because Trump’s moves to roll back regulations on the Appalachian coal industry won’t be enough to preserve it. The Appalachian coal sector has been shrinking for years as companies are forced to spend more money to access harder-to-reach seams of the fossil fuel. Meanwhile, competitors in regions including the Illinois Basin and Powder River Basin of Wyoming and Montana have much thicker coal seams that are cheaper to get to. Critics say such a proposal would be expensive and misguided. U.S. power plants burned at least 110 million short tons of Appalachian coal in 2016, according to Andrew Cosgrove, an analyst at Bloomberg Intelligence. A payment of $15 for each of those tons would cost at least $1.65 billion. Justice said he’s discussed the plan with, among others, Department of Energy Secretary Rick Perry, Vice President Mike Pence and Jared Kushner, Trump’s senior adviser and son-in-law. Asked whether Trump is considering Justice’s plan to prop up the coal industry, White House spokeswoman Kelly Love said there’s nothing to announce at this time. While it’s legitimate to worry about the reliability of the U.S. power grid, the decline of the coal industry isn’t raising much of a threat at a time of cheap and abundant gas and fast-growing wind and solar power, said Jason Bordoff, director of Columbia University’s Center on Global Energy Policy. It’s “unfortunate and irresponsible” to float a policy idea like this, Bordoff said, when U.S. and global forces are causing a structural decline in the Appalachian coal sector and communities need to diversify the local economy.